The Herbst Firm's criminal defense lawyers take pride in client centered representation. We believe that while skill and command of the courtroom make for a successful lawyer, they do not necessarily make for a complete lawyer. The Herbst Firm focuses not only on results but also on personal attention and compassion. It is our goal to achieve the best possible outcomes for our clients and also to keep them informed every step of the way. If you want the services of a complete lawyer for your criminal or personal injury case contact the Herbst Firm for a free consultation at any time, 24 hours a day. Being charged with a crime can be one of the most stressful and frightening events that one can experience. It can feel like the whole world is turning against you, and not just the police and the prosecutors. Friends, and even family members can read a police report or hear about criminal charges and make assumptions about you. All defendants are presumed innocent under the law, but out in the community your reputation will suffer the minute you are arrested. This is exactly why you need to hire a Maryland criminal lawyer that will be completely devoted to fighting for your rights and for your freedom. The Herbst Firm will relentlessly work with passion and energy to resolve your criminal case and achieve the best possible outcome. The Herbst Firm will not settle your case unless you are completely satisfied, and our firm will never shy away from fighting your case at trial. Do not wait to hire a criminal defense lawyer! The early stages of a criminal investigation are a critical time for a defendant to have representation. Police and prosecutors often receive the majority of their evidence from the defendants themselves, and a lawyer can prevent this from happening, and assure that your rights will be protected. Just because a suspect has the right to remain silent does not mean all law enforcement officers will take this right seriously. Many police officers will make false promises and tell a suspect everything will turn out okay if there is cooperation, but this could not be further from the truth. The minute a suspect begins talking the police are looking for a way to use the words against the suspect. If you are arrested or being investigated say you want a lawyer and do not give in to the false promises of a police officer. You can always go back and talk at a later date, but you'll do it with a lawyer in your corner protecting your rights. The criminal defense division of the Herbst Firm handle cases in all Maryland jurisdictions including Baltimore, Anne Arundel County, Montgomery County, Prince George's County, Howard County, Frederick County and the entire Eastern Shore. We also handle Federal cases in the United States District Courts in Greenbelt and Baltimore City. Benjamin Herbst, the Firm's lead criminal defense attorney has represented clients in numerous types of criminal cases including DWI and DUI, drug possession and distribution (marijuana, cocaine, heroin, prescription pills, etc. ), theft, robbery, murder, burglary, gun crimes, suspended license, disorderly conduct, assault, prostitution, and probation violations. We will aggressively represent defendants facing federal drug trafficking, conspiracy, extortion, and racketeering charges. Benjamin is also an experienced juvenile crimes attorney, having dealt with numerous cases involving teenage defendants. He handles juvenile cases from intakes hearings all the way up to trials at the various circuit courts around the state. The laws in Maryland can be extremely tough for juvenile defendants that are charged with certain felonies such as robbery and first degree assault. Even if the defendant is under the age of 18 he or she will be arrested and charged as an adult, and could face being detained at an adult jail. Juvenile defendants that are in custody on adult charges are separated from the general population until their 18th birthday, but the conditions at these adult facilities can be harsh and demoralizing. Minors do not receive suitable education and counseling while in jail, which makes it all the more important to retain an attorney that has experience filing additional bail reviews, juvenile transfer of custody motions and reverse waiver motions. Benjamin will never take on a criminal case with the expectation that his client will simply plead guilty. He will put in the work to make sure his clients receive the best possible outcome, even if this means taking the case before a jury. Criminal trials are unpredictable, which makes it all the more important to have an attorney who has seen it all. Benjamin has represented thousands of clients in criminal and traffic charges in dozens of different court houses, and there is no case too big or small. He has also represented hundreds of clients facing violation of probation charges, and treats theses cases with the same care and effort as a new charge. In the last couple of years there have been drastic changes in the laws regarding VOP cases and Benjamin knows how to use these changes to the advantage of his clients. Some defendants believe the new law governing technical probation violations will apply to their cases, and assume that a lawyer will not be necessary but this can be a mistake. Catching a new charge is not the only non-technical probation violation, as the law is more complex than many people realize. Benjamin knows all the ins and outs of the new probation law under the Judicial Reinvestment Act (JRE) and can provide a free consultation anytime about this new law. 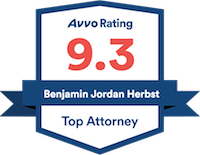 Benjamin Herbst also handles civil cases involving peace orders and protective orders. While these cases are considered civil, they have potential consequences that are similar to criminal cases and therefore should be handled by a criminal defense lawyer. If a person has a peace or protective order granted against him or her the case could become part of the permanent public record, which could be easily accessible by employers, schools and potential partners. Additionally, violation of peace and protective orders could lead to new criminal charges that carry up to 1 year in jail. Treat a peace or protective order case with the same type of caution that you would a new criminal charge, and never walk into court without representation. If you have a new pending criminal, traffic or protective/peace order case, or even think you are being investigated for a crime there is no reason to try to go at it alone. Additionally, if you have an outstanding arrest or bench warrant, even if it's many years old, there is no reason to sit back and wait to be arrested or to hope the police will forget about it. Warrants do not do away on their own, and The Herbst Firm can help recall your warrant and close your case once and for all. Call us today for a complete explanation about the process and what the likelihood is that you won't have to spend even an hour in jail. The Herbst Firm's personal injury attorneys also understand that being injured in a car accident, slip and fall, or other injury as a result of someone else’s negligence can be a traumatizing experience. Even if the pain of the actual injury wears off, the injured can be left unable to work, with medical bills piled high. We will fight relentlessly to try to restore our clients back to their lifestyle before the injury accident by not simply pushing your case to a quick settlement, but rather vigorously fighting the negligent party and the insurance companies for a just resolution. Insurance companies claim to care about their customers with catchy heart felt slogans and high priced celebrity spokesmen, but when it comes time to pay the money that in injured person rightfully deserves the insurance companies run for the hills. These billion dollar profit machines routinely try to take advantage of unrepresented injury victims by convincing them to give a statement and then offering low ball settlements. It is so important not to wait to retain a personal injury lawyer if you have been injured in an accident. Waiting to hire a lawyer may negatively impact your civil case and can cost you thousands of dollars. Benjamin Herbst will do whatever it takes to get his clients the compensation they deserve in any type of injury including slip and fall accidents at stores, hotels, movie theaters and malls. He also handles all types of on the road accidents including pedestrian, truck, motorcycle and bicycle accidents, as well as defective products and medical malpractice. Call or email Benjamin anytime for a no obligation consultation 7 days a week. The personal injury division of the Herbst Firm specializes in negotiating fair settlements and filing lawsuits throughout Maryland. We take pride in representing our clients against large insurance companies who pretend to care about their customers right up until the time comes to pay out a claim. Types of injury cases that our personal injury division handles include car accidents, motorcycle accidents, slip and falls, and defective products. If you or someone you know has been injured due to someone else’s negligence contact the Herbst Firm immediately for a free consultation. What are Common Penalties for DUI in Maryland?Compared to some other states the DUI laws in Maryland are relatively lenient, but it would be inaccurate to say that first offenders generally receive a mere slap on the wrist.More..."
What are Maryland's Toughest Gun Laws?Those of you who have read our blog are probably aware of the changes in state gun laws over the last couple of years.More..."
What should I do if my probation is about to be violated?Probation definitely has some value in the American court system, but most people with the knowledge and experience of how the system works would agree that probation has serious drawbacks.More..."
I can’t begin to thank you enough for your professionalism and for going over and beyond. I appreciate all your efforts!